SATELLITEN reveals the enormous amount of satellites and space junk that are currently orbiting the earth. It also shows how far this technology is now embedded in nature, by directly influencing geological interventions in the earth, from its position in space. SATELLITEN charts the satellites’ trajectories, whilst simultaneously obliterating the section of the map over which they orbit. SATELLITEN reminds us of the first phase of the Alchemist process, Nigredo, to putrefy or decompose the material into black matter. Satellites are used for almost all modern achievements, from communication or navigation systems to environmental monitoring and military purposes. There are approximately 3000 satellites in orbit, about 1000 of those are still operating. 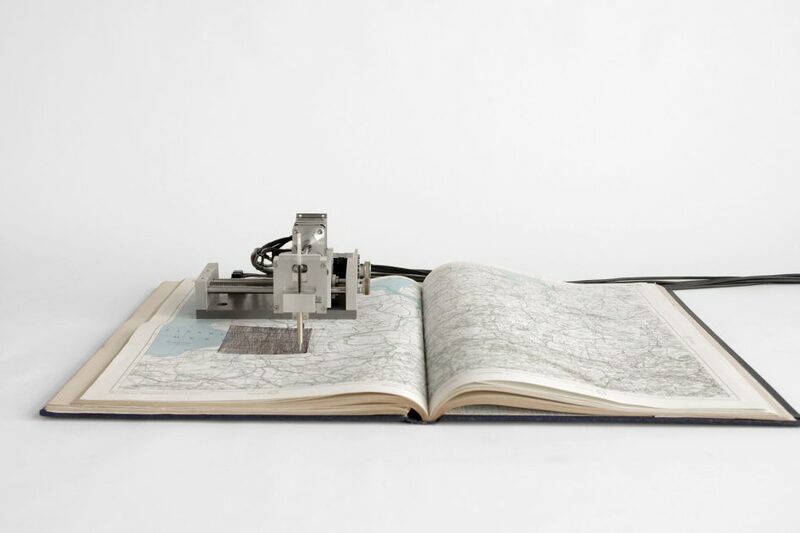 The drawing machine SATELLITEN (2015) accesses this data to keep a record of the amount of satellite flyovers in regard to its own location. In a square of approximately 10cm², the machine traces their lines in real time until the far away object leaves our horizon again. SATELLITEN uses its own position as starting point and old maps of the area as a base for its drawings. For a long time, maps and atlases used to be one of the only sources for geographical knowledge. Now the paths of the satellites start to form on top of the familiar neighbourhoods, thus setting the normally invisible traffic in relation to our usual habitat. But as time passes the lines of the satellites will obliterate the well-known streets and cities, overwriting not only the original information on the map but also the marks left by the preceding satellites.